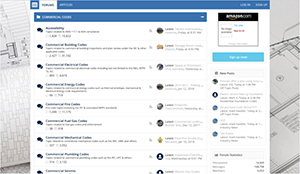 The Building Code Forum is a robust forum message board for building code talk, sharing information related to the building industry to include all construction codes. The Building Code Forum is a robust forum with over 14,000 discussions, over 160,000 messages and over 5,000 members. If you have a building code related questions and are seeking answers spend a few minutes and search for it here and if you don’t find what you are looking for register and post a question and most likely someone will help you to come up with an answer.